Sourdough is an American tradition, and baguettes are native of France, so our Sourdough Baguettes are not only original, they’re the best of both worlds in bread form. And while we’re on the topic of irresistible, we are in no way responsible for your being attacked by squirrels or pigeons should you unwrap this amazing recipe idea in a public park. It’s probably best to not even let your pet into the kitchen while preparing them. 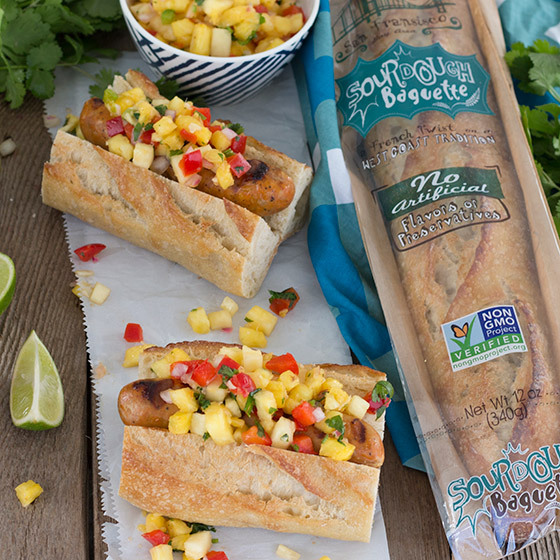 What would you expect from a grilled sausage cradled inside a fresh sourdough baguette, generously covered in a perky piquant salsa, and perhaps a dash of Dijon? Believe me, you’re gonna make friends fast if you decide to share. And by all means share to your heart’s content; we make it every day, so go nuts. Cut baguettes in sections long enough to accommodate brats. Slice each baguette “bun” down the center and set aside. Make the mango salsa. In a large mixing bowl, combine mango, pineapple, pepper, onion, cilantro and lime juice. Stir to thoroughly distribute ingredients and refrigerate until the brats are ready. Heat grill to medium-high heat. Grill brats until cooked through (approximately 3 minutes per side). Open each baguette “bun” by folding down the sides that you cut earlier. Add a brat and top with mango salsa.